With the winter season approaching it’s becoming apparent that the season of sickness is also on its way. Last year people seemed to be getting sick left and right, and a lot of the time it started with just one person being sick. There’s always that one person that just won’t miss school, no matter how sick they are. They might see it as being responsible, but in truth, if they’re really sick, coming to school is one of the least responsible things to do. There’s nothing wrong with powering through a little cold, but when people who are sick come to school, they’re only spreading their illness to others and probably making it worse for themselves too. When you are sick, your body needs to rest in order to get you better. So it’s important to stay home when you need to. Missing one day of school isn’t the end of the world, especially when its missed because of health reasons. Maybe you know there’s a big test coming up, or a choir concert, that you really don’t want to miss. You can try to prevent being sick for that. Not all sickness is preventable, and sometimes no matter how much you try you still get sick. But here are some things you can try. Most information came from WebMD. Wash your hands. It’s important you wash your hands anyways, but it’s even more important during flu season. Our hands touch a hundred things every day, and each thing as thousands or millions of germs. Don’t hang around sick people. It doesn’t matter how close of a friend they are, or how strong you think your immune system is, you still have the chance of getting sick. Another thing you can do is eat healthily. It’s good to eat healthy all the time, but it’s extra important when you’re sick. Your body needs the extra nutrients to help fight sickness. Keep things around you clean. You can use cleaning wipes or sprays to wipe down desks. You never know if the person who sat there before you coughed all over it. Get plenty of sleep. If your body is weak and tired it’s not going to be able to fight bacteria. Being sick isn’t fun for anyone, so these rules should be followed as much as possible, especially this time of year. 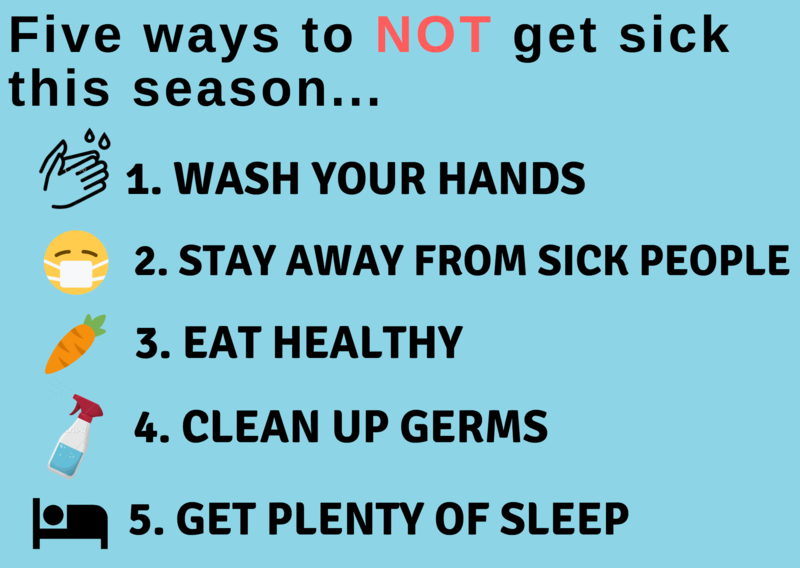 Make sure to stay healthy, because, in this season of sickness, anyone can catch the germs. Above are five ways to avoid getting sick during this winter.